Congratulations to Huong Tra Ly from Paignton who passed her automatic practical driving test on the 16th of January with just a few minor faults. Huong said that passing her test will be life changing. Her husband has already bought an automatic car so she can drive straight away. 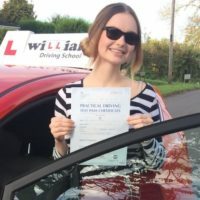 Best wishes from your automatic Driving Instructor Ian Lynn and the whole team here at Williams Driving School.